The A-league launched to little fanfare and only the slightest of promotion on Friday night, sandwiched between two Socceroos World Cup qualifying fixtures, at the tail end of another excellent FFA Cup season, and after the exhilarating highs of the womens games against Brazil, and with no Sydney or Melbourne Derbies scheduled. (and all that without stating the obvious – its only been a week since the AFL and NRL finished). What chance did round 1 of the A-league really have? The A-league launched this weekend and opened Friday night with Melbourne City v Brisbane at Aami Park. In good conditions, the match attracted 9,089 spectators – not great, but it should be noted that this was a 4 year high for City v Brisbane at the venue. 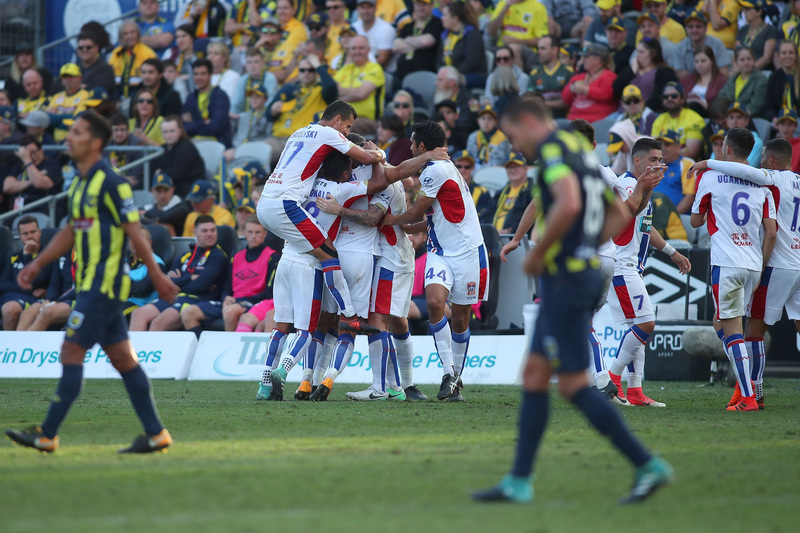 On Saturday, Central Coast and Newcastle played in front of an excellent 12,044 – again a high attendance at Central Coast Stadium for that fixture. Saturday nights marquee match between Victory and Sydney FC at Etihad Stadium, again in good conditions with the stadium roof open for the occasion, pulled in 24,804 patrons – and is probably a fizzer for this particular fixture. A lack of promotion heading in, plus round 1 really being overshadowed by national soccer teams at the present time, were all contributors to this, although some on twitter were wondering if the recent FIFA/FFA dramas were having an effect. Sunday matches were a mixed bag. 8,154 turned out to watch Wellington and Adelaide – a crowd which is double Wellingtons present membership, and as such Im not sure anyone can really fault the crowd there, after 9,000 turned up for the Friday in Melbourne. 12,223 was reported at Spotless Stadium for Western Sydney and Perth, with some skepticism of that figure being given voice on social media. In total 66,314 persons attended Round 1 at an average of 13,263. This figure – due to a lack of Melbourne or Sydney derby’s – is 38% less than the 106,365 that attended in Round 1 last season. Note our crowd tracker for this season is here, and previous seasons are here. You can also find attendance data at UltimateAleague.com and Aleaguestats.com, or you can join the discussion at FourFourTwo. Victory’s saturday night game v Sydney FC attracted 84,000 viewers in the metro 5 city area, and a further 33,000 viewers in regional districts for a total of 117,000 nationally – this is less than the 118,000 that watched last seasons Friday night opener on FTA on SBS2 in metro areas alone (and that game also rated 129,000 on Fox). The game rated a further 107,000 nationally on Foxtel (Saturday night fixture in r1 last season attracted 142,000 viewers to Fox, with no simulcast on SBS2). While, the FTA figures were not as high as had been hoped, they probably reflect the lack of atmosphere heading into round 1, and I expect a general improvement as the season goes on – at least until the Ashes and BBL kick in. Foxtel ratings for the round opened with an acceptable 100,000 for City v Roar on Friday night, while Saturday afternoons F3 Derby pulled 63,000 on pay tv. (Central Coasts saturday evening game in r1 last year had 60,000 viewers on Fox). Sundays games pulled in a stock standard 75,000 for Wanderers and Glory, while Wellington only managed 39,000 on Fox for its game against Adelaide. In all, Round 1 Aleague Fox ratings totaled 384,000 with a 77,000 ave. These were down 18% on Round 1 last year (93,000), but ahead of the 2016/17 year ave of 67,000. With no Sydney derby pulling in extra viewers on Fox (142,000 in Round 1, 2016). Wellingtons game against Adelaide also attracted half the audience it did for Melbourne City in Round 1 last year (80,000). Note: footyindustry.com is expressly forbidden to display ratings in a tabled format. As always, you can join the ratings discussion at FourFourTwo.